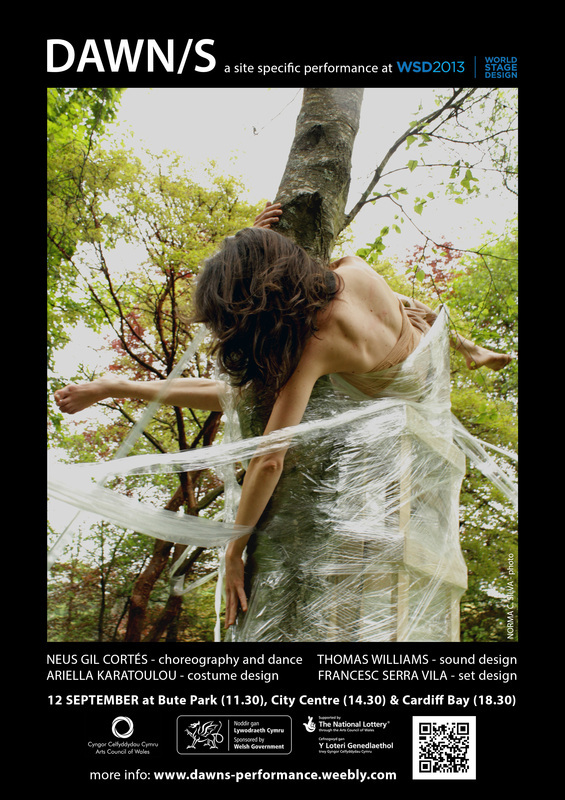 Set in the public space, DAWN/S is a performance that explores the rebirth and transformation into a new being, that keeps, nevertheless, the essence of what is left behind. 4 European and 4 international emerging artists. The structure consists of an assembly of two very common elements: chairs, which come together forming a symmetrical timber structure offering a platform two meters above the ground. This timber construction has to be attached to a vertical element. In the public space, a tree, a lamp or a column can be such a support. Once fixed, the set is wrapped with plastic film: it covers the structure and it grows like a spider web to reach other points of the surrounding. - During the performance, the dancer will modify the set: when breaking the plastic skin and getting out of it, the structure will change with no turning back. - The mutability of the set is also evident every time the structure is placed in a new location.The shape of it and the spatial relationship between audience and action will be different each time.Simultaneously,we may change pedestrian’s perception of a place with the performance.This is a challenge that deeply inspires us. Since DAWN/S was presented at WMC in February 2013 and especially after being selected for WSD2013, we have always wanted to developed this project further. Structure-wise, we are currently concentrated on the skin: we think it is very important to emphasize the moment when the being gets inside the structure before transforming. This is the last proposition, which may suggest the dawn itself: this changing part of the day that welcomes, each time, new possibilities.